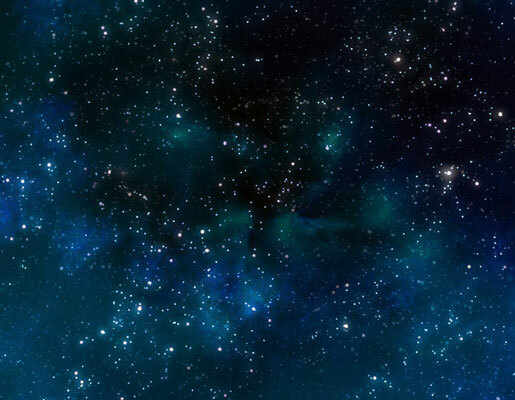 Dark-sky stargazing: So many stars! The first thing you’ll notice as you move from city to countryside is the sheer number of stars overhead on a clear night. Make a habit of counting how many stars you can see in a familiar constellation such as Orion, from different locations, and that number will help you gauge just how good (or bad) your sky is. You can catch glimpses of the Milky Way, the Earth’s galaxy, from the outskirts of towns and cities, from where it may appear as a faint patch overhead. Get away from light pollution, though, and you can see the band of the galaxy stretching across the sky. 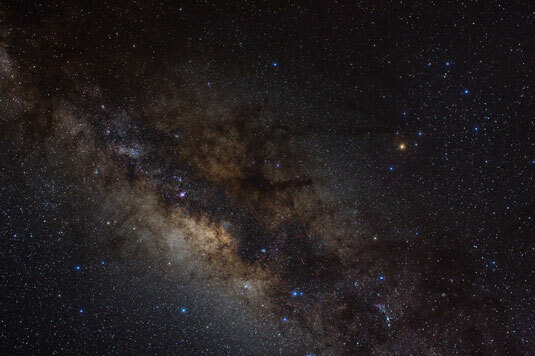 If you ever get somewhere really dark, then you’ll begin to see breathtaking structure in the Milky Way – dark bands and blobs that come from clouds of dust in the galaxy blocking out the starlight of the stars behind. 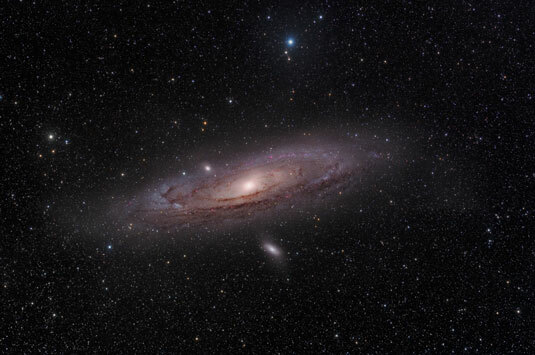 The next closest big galaxy to Earth’s is the Andromeda Galaxy, M31. If you know where to look, you can catch glimpses of the Andromeda Galaxy from light-polluted skies, but you can see it best when it’s darker overhead. The Andromeda Galaxy should look like a cigar-shaped smudge to your naked eyes. Through a good pair of binoculars or a telescope you can see more detail; perhaps you’ll catch a glimpse of the Andromeda Galaxy’s nearby companion galaxies, M31 and M110, or even see dark dust lanes within the main galaxy itself. Remember that what you’re looking at is a galaxy that’s even bigger than the Milky Way, containing perhaps a trillion (1,000,000,000,000) stars. Aliens living on a planet orbiting a star in the Andromeda Galaxy would look up into their night sky and see a faint Andromeda-like smudge, too – our Milky Way galaxy seen from 2.5 million light years away. If Andromeda is an easy galaxy to find, its neighbour, the Triangulum Galaxy, or M33, is much more elusive. 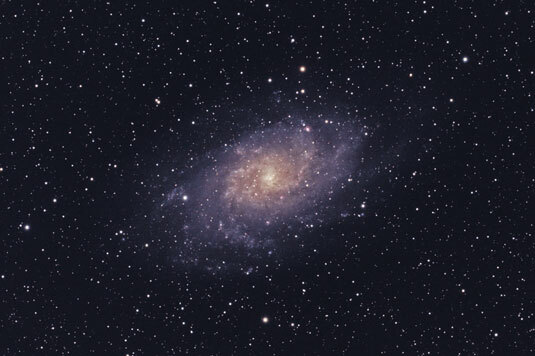 The Triangulum Galaxy is much fainter and therefore harder to find if any light pollution is around, but that makes it a great benchmark for dark skies. Even under clear rural skies you’ll have to use averted vision to catch it at all. M33 looks like an even fainter version of the Andromeda Galaxy, almost impossibly faint, because it’s smaller, farther away, and has less than a tenth the number of stars than Earth’s nearby giant galaxy. 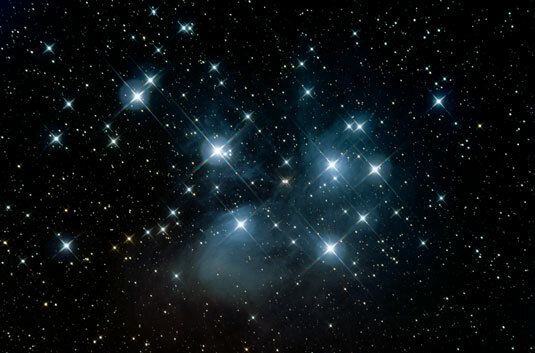 A great test of your eyesight — and your dark skies — is the faint fuzzy known as the Pleiades, or the Seven Sisters (M45 to its friends). Under city skies, you see it looking like a distinct fuzzy patch. You may be able to pick out the brighter stars, but you need to be somewhere dark; you’ll have to wait for a long time to let your eyes adapt before you’ll see all seven. Some people with excellent eyesight claim to be able to see more than seven stars in the Pleiades. Have a go, and after you’ve counted the stars with your naked eye, see how many you can spot through a pair of binoculars. Wow, right? 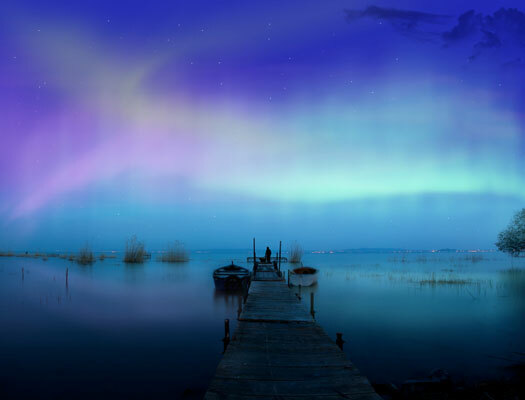 The elusive, shimmering colours of the northern or southern lights, the aurora borealis or aurora australis, are chased away by light pollution. In order to see the aurora best, you have to head to high latitudes. In the northern hemisphere, you can see the aurorae best from the Arctic, northern Europe, Scandinavia, northern Russia, Canada, and northern America states. In the southern hemisphere, you see them best from Antarctica, southern South America, New Zealand, and southern Australia. 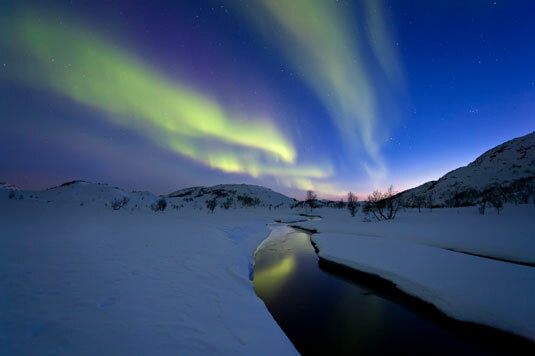 The aurorae don’t happen every night, only after strong solar storms! On any night, you can expect to see a few shooting stars under dark skies, but during meteor showers this rate increases dramatically. 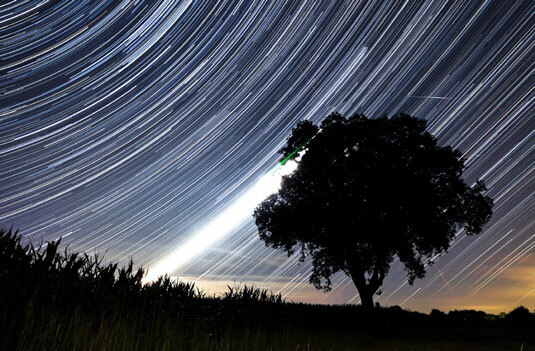 At the peak of an active meteor shower like the Perseids or the Geminids, you can expect the maximum rate to get up to 100 per hour under very dark skies – that’s 100 shooting stars an hour, more than one per minute! 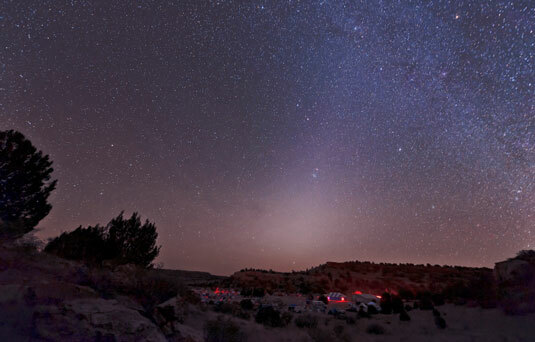 If you’re stargazing from a good dark site in spring or autumn, you may catch a glimpse of the elusive zodiacal light, or light from the Sun scattering off particles of dust in the solar system and reflecting back to your eyes. You can see zodiacal light only at the end of evening astronomical twilight in spring or the beginning of morning astronomical twilight in autumn. The zodiacal light looks light a faint cone of light that stretches along the line of the zodiac, or ecliptic. Under exceptionally dark skies, you can see a yellowish colour to the zodiacal light, which can stretch across the whole sky in an arc and can even get bright enough to cast a shadow. The elusive partner to the zodiacal light is called The Gegenschein. The name is German, meaning counter-shine, and it’s light from the Sun reflecting off particles of dust that lie directly opposite the Earth from the Sun, in a part of the sky called the antisolar point. You need to be somewhere really dark, and you need to look in the right direction. Follow the cone of the zodiacal light up, along the ecliptic, and look for a faint oval glow; this is Gegenschein. Even if you’re somewhere with no manmade light pollution in the sky, you may notice that the sky still isn’t pitch black. That’s partly due to something called airglow, which is the emission of light by the molecules of gas that make up the atmosphere. You may catch a glimpse of airglow around one fist-height or 10 degrees above the horizon, where you’re looking through more atmosphere. It’ll look like a faint blue glow in the air.